Are you the kind of women that finds relaxation includes lighting candles in all rooms around the house? You stop and think, what a wonderful ambiance & aroma. Somehow, over the years you have fallen intoxicatingly in love with candles. And now you may find yourself unaware of the significant damage these seemingly innocent scents can cause. 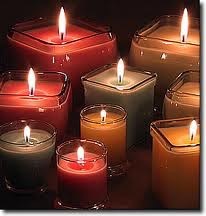 Did you know, Paraffin candles can cause liver damage, leukemia and neurological problems? Over time, the smoke from the candles can damage our heart and lungs. Dr. Ruhullah Massoudi, lead author of the study, found that after just six hours of burn time, a paraffin candle releases a significant amount of dangerous fumes such as alkenes which are poisonous. Benzene and Toluene, are also found in the residue from burning toxic candles. Benzene is cancer-causing and toluene affects the central nervous system. So how about that special candle you are buying as a gift this year? Yes, you too can be breathing formaldehyde and not know why you are getting those headaches or migraines. Some may ask, how can scents be so toxic? In the U.S. fragrance formulas are considered trade secrets. The fragrance industry “self regulates itself”. This means companies do not have to tell anyone, including the FDA what is in those formulas. Endocrine Disruptors are in our homes, masquerading as toxic scents. Exposure to high amounts of lead from toxic candles has been linked to hormone disruption, behavioral problems, learning disabilities, and numerous health problems. Air fresheners, perfumes, household detergents, dryer sheets, and candles are just a fraction of that list. Xenoestrogens are synthetic chemicals that mimic or interfere with estrogen in our bodies. They form a subset of a broader group of chemicals known as endocrine disruptors. Exposure to xenoestrogens, have been linked to obesity, breast, colon and ovarian cancers and to decreased testosterone levels, prostate cancer, and lowered sperm count in men. There are well-known carcinogens, reproductive toxins and neurotoxins, in cosmetics. Recent Reports advise us, “makeup, shampoo, skin lotion, nail polish, and other personal care products contain chemical ingredients that lack safety data!”(5) In fact, applying perfumes to our skin may cause contact dermatitis. It is common to find formaldehyde in cosmetic formulations such as shampoo, sunscreen, mouthwash, perfume, antibacterial hand soap, nail polish, and even products designed for children such as bubble bath. Formaldehyde is banned from cosmetics and toiletries in both Sweden and Japan and generally recognized as safe (GRAS) in the U.S. Formaldehyde is a known carcinogen. Conclusion- Choose to live without toxic scents. Avoid cheap and expensive perfumes, candles and non-organic skin care products posing as having therapeutic properties. Your wellness is determined by far more than your genes.